Smaller turbocharged engines cannot match the power and efficiency of a modern, larger, normally aspirated engine, but they are getting very close. Last year Hyundai announced that it would produce a new Santa Fe. The Santa Fe has been a huge success for Hyundai since it was first introduced. When that announcement came this publication predicted that Hyundai would use its now famous 2.0 TDI (Turbo Direct Injection) four cylinder engine to power this new vehicle and earn high marks for fuel efficiency. We were half right. The 2.0 Turbo is a proven engine now, having been used in the Sonata Sedan in huge numbers as well as in the Genesis Sport Coupe. The expectation was that with this new engine, the new mid-size Santa Fe would have power matching the best V6 engines in the market, and also would bring greater fuel efficiency. Unfortunately, like in most applications, the smaller turbo engine can do either of those things, but not both. The 2013 Hyundai Santa Fe Sport is now EPA tested and available for purchase. The vehicle breaks new ground by being one of the lightest vehicles in its segment given its size. The 2.0 TDI engine generates 264 horsepower and is mated to a six speed automatic transmission. The AWD drive version, which is how most sell, is EPA rated at 19 mpg city, 24 mpg highway for an overall rating of 21 mpg. These numbers are not impressive by comparison to previous competitors with engines this powerful. At 3706 pounds this five seat vehicle is very light by any measure. So it isn’t weigh that is keeping the mileage low. 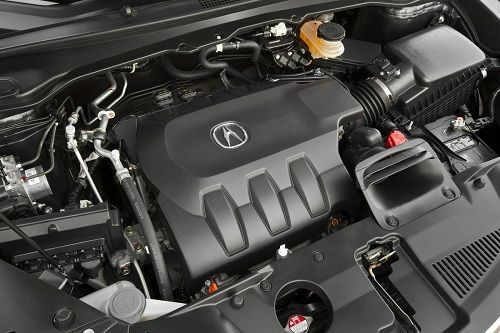 Let’s now compare this four cylinder turbocharged, newly released vehicle to one of its competitors, the 2013 Acura RDX. Like the Hyundai it is a 5 passenger, AWD vehicle, newly released and updated. The engine is a 6 cylinder, normally aspirated (non-turbo) making 273 horsepower. Like the Hyundai the Acura also has a 6-speed transmission. The Acura is heavier, weighing 3852 pounds. The EPA rates this six cylinder engine at 19 mpg city and 27 highway for an overall rating of 22 mpg. When comparably equipped the two vehicles are also about the same price, with the Acura being about 10% more expensive. Lest you think Acura is not a good comparison for some reason, it should be noted that the Kia Sorento V6, which weighs 4134 pounds, achieves 18 mpg city and 24 mpg highway. When mid-size sedans are compared the story is the same. Small, turbocharged four cylinders can either match the power of a V6 or the fuel efficiency, but they cannot do both at the same time. For example, the Honda Accord is one of the remaining mid-size cars that offers a modern, updated V6 engine that produces 278 horsepower. The Accord is rated by the EPA at 21 mpg city and 34 highway, for a combined 25 mpg. The most recently released competitor to the Accord that has a four cylinder turbo that comes close to this is the new Chevy Malibu 2.0L turbo. The Malibu’s engine produces 259 horsepower. Before we go on it should be noted that these smaller turbos are not really keeping up in the horsepower department. They come close, but they are not really as powerful as the V6 engines their own companies can produce. The Malibu has EPA mileage estimate of 21 city and 30 highway according to GM (GM news 9-20-12). With less horsepower and 4 mpg lower highway mileage why would Chevy not have gone with a V6? There are many reasons why manufacturers are moving away from the V6 and going in the direction of the turbocharged four. One reason is cost. If a company can make just one set of front engine bay mounts and build their entire model around only four cylinder engines, they have a slightly lower cost to produce that model. The Ford Fusion, Hyundai Sonata, Kia Optima, Chevy Malibu and others are doing this. In addition to cost, manufacturers want to differentiate their own products from one another. Many manufacturers have multiple models using the same platform and by limiting the V6 to their more prized models they create the illusion that only premium vehicles should have that engine. A great example of that is the Cadillac ATS. Cadillac offers the 3.6 liter V6 in this model as the top of the line engine, with the turbo 4 (the same one used in the Malibu) as the mid-level engine offering. Of course, Chevy has for many years offered that “premium” V6 as the base engine in other cars. There are two more insidious reasons for the four cylinder turbo supplanting the V6 and by mentioning them this author bounced this story out of the “news” category and into the “opinion” category. The first is that the EPA test cycle likes turbos. The turbo does not always work in cars that have them. Rather, unless a certain RPM is achieved, the turbo is just along for the ride and the car is operating as a normal four cylinder engine. That bumps up the EPA numbers a bit. Just a bit, but a bit matters a lot these days. Like most authors I have read every top automotive publication and all of their tests. For 30 years. It is apparent, and consistent, that in actual road tests the four cylinder turbos don’t get better mileage than the V6 engines. They are also not even close to being as fast as the V6 engines in that class. For example, Car and Driver found the V6 Accord to go from 0-60 mph in under 5.5 seconds. Chevy rates its Malibu 2.0L turbo at 6.3 seconds. By way of defending the Malibu please don’t take this comparison to imply that the Malibu is not a great car, or perhaps even a dollar for dollar value vs the Accord. On the contrary, the Accord used to be a bargain quasi-sports sedan. The bargain part of that is now questionable. Furthermore, the tests are all full of comments about turbos lagging. That means they hesitate for a moment before the power comes on. Those same publications often cite the four cylinders as noisier, having more vibration (of the bad type) and being less satisfying to drive long distances due to the higher RPMs they maintain on the highway. These are things that might not be apparent on a short test drive. The last part of this insidiousness is that there seems to be a determined effort by all of the automakers from Honda to BMW to Lexus, to try to convince the buying public that slow can be fun. In some ways a slow car can be fun. For example by comparison to other slow cars. However, as a person who drives literally dozens of new cars per year on and off track, let me tell our readers that a fast car is almost always more fun than a slow one on the road up until you reach supercar levels. At a certain point cars like the Corvette start to become no more fun than lesser cars because there simply is not enough road to use the car’s abilities. Examples of cars being marketed as “fun” that are not speed competitive in their class or price point include the Lexus CT, The Honda CRZ, and the coming BMW 320i. Are these great cars? Certainly, but they are so slow compared to their price points that they stick out. The point of this article is to inform and advise. If you find yourself being swayed by advertisements or salespeople telling you that a turbocharged four cylinder is the match of a V6 you should hold onto your wallet and start some comparison shopping. This is interesting because Ford claims otherwise. Also, when I drove the Dart 1.4 Turbo and the 2L, the 1.4 felt sprity and alive. In comparison, the 2L felt anemic. I wonder if it's more a question or torque versus raw horsepower? Absolutely. Torque is a huge reason. Also, I think you are comparing two fours here, not a Turbo four and a V6. Ford has some great products, but their strongest four in the Fusion is not even close to the Honda V6 in power, and the fuel economy is almost exactly identical. Honda actually gets better highway mileage. Thanks for reading and commenting! I agree, the difference between my Alfa Romeo 4 cylinder and the V6 are more about torque than anything and all things considered, the V6 is economical at highways speeds but looses out in traffic where the 4 cylinder does better. It's a tricky balance for carmakers. Why no torque vs. RPM data? Turbos torque starts lower in the rpm range, where most of day to day driving lives. And most car makers have made turbo lag insignificant. BHP is more indicative of top speed. For everyday driving, especially if you live above sea level, turbos seem much more fun and responsive. You're right and so far I feel the best turbo engine for city driving is Subaru's or any flat-opposing system. They are torquey at low rev and deliver raw HP later. I think the manufacturers gain the most by replacing a V6 with Turbo 4. For city driving, it the T4 will likely get better mileage. On the open road, cruising, the V6 works less and requires less throttle input when power is needed, but mileage should be close to the same as the 4 even with 2 more cylinders. Add the fact that the 4 cylinder is a lighter engine. This all says to me the newer engines are designed to stretch the CAFE numbers. . Note that Honda does variable cylinder management on their latest V6 to get even more mpg. Although from what I have read about what others have experienced, the difference VCM makes is around 1 or 2 mpg, max. How do they know the difference? Because there are some 3rd party devices out there to defeat VCM which attributed to some noise and vibration issues, in some older Honda/Acura models. In terms of reliability turbochargers have come a long way. But keep in mind, if you ever experience a 'non turbo' problem in a turbo engine, repairs are generally more expensive in any case.